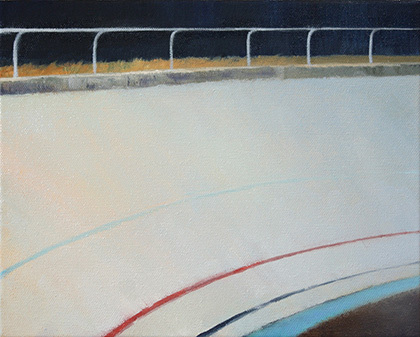 This painting is for the Marymoor Velodrome Association’s annual fundraiser auction. Funds support velodrome operation and maintenance; four nights of racing a week all summer; training classes; youth programs; and scholarships to send our top women and junior athletes to national and world competition. The Stage is Set, oil on canvas, 8 in x 10 in, 2012. I hope you can come to the Pioneer Square Artwalk tonight. As well as the usual gallery openings, Todd Jannausch’s Small Voids art gallery/installation will spring up along a block or two near the TK building. 100 (or is it 110?) artists’ work will be in his small illuminated “galleries.” Let me know if you spot mine. (Hint: it combines landscape and architecture, with a touch of surrealism.) CityArts has a nice write-up. The NWFA exhibition just went up at Phinney Center Gallery. Three of my works were chosen for the show, along with work by fifteen other amazing artists such as Suze Woolf and Dorothy McGuinness. I hope you can join us for the opening reception next Friday! Yield. Oil on panel. 36 in x 24 in. At the Phinney Center Gallery through November 28.